Aging -- and more specifically, the aspiration to slow human aging -- is the most important neglected issue of our time. There are many things that could kill the world’s current 6.5 billion plus population, but the vast majority of those currently alive today, especially in the developed world, will die from age-related causes. The diseases of aging could be the real scourge of the 21st century. That is, unless we do something to remedy the biological vulnerabilities we have inherited from our evolutionary history. The current approach to medical research is to tackle individual diseases, one at a time. So we spend large amounts of public funding on basic research into cancer, heart disease, diabetes, Alzheimer’s, etc. But we invest very little in understanding the biology of aging and how it impacts our health prospects. Supplementing the current medical approach with one that also tackles aging would help us take a more inclusive approach to health extension. Slowing down human aging may prove to be one of the most effective tools of preventative medicine. Aging has many adverse effects on our health prospects. As adults age, their risk of developing any one of a host of age-related diseases -- ranging from cancer to heart disease and Alzheimer’s -- dramatically increases. Over three-quarters of cancer deaths occur among those aged 65 or older. The same is true for heart disease. And nearly half the population over the age of 85 has Alzheimer’s Disease. Not all species age the same way. So why do humans age the way we do, rather than the way mice, turtles or whales age? How a species ages reflects their distinct evolutionary history. Take the turtle. Having a hard shell reduces the risk of being eaten by other predators. Thus, turtles have a much longer life span than more vulnerable animals, like mice and fish. Size can also confer a longevity benefit. In the wild, size really does matter. So does having the ability to fly, and thus escape predators and find scarce food. Many different things can impact the life expectancy of a species. Humans possess the greatest product of evolution -- a complex brain that gives us the ability to reason and use language. All existing species have adapted to different external threats, some more successfully than others, to increase the likelihood that these threats could be warded off long enough to satisfy nature’s game plan: reproduction. Seventeenth-century British philosopher Thomas Hobbes famously described life in the state of nature as “nasty, brutish and short.” Hobbes was certainly right about life being short, since throughout human history people have died very young. The obituary pages of human history would be filled mostly with very young children, unlike today’s obituaries which, at least in the developed world, are filled mostly with those over the age of 65. Thanks to improvements in nutrition and a vast array of public health measures, like the sanitation revolution, vaccinations and improvements in childbirth, we have been able to dramatically increase life expectancy by 30 years in the developed world, in just the past century. But making further gains in life expectancy will be difficult given the impact aging has on our health prospects. Even if we find a cure for one of the diseases of aging -- like cancer -- it would only extend life by a few years, as most people will likely be afflicted by one of the other diseases of aging. But if we could modify the biological mechanisms underlying aging, we may be able to significantly increase the number of disease-free years humans can expect to live. This would reap enormous individual and societal benefits. Is there any reason to believe this could be achieved in the foreseeable future? Longevity scientists certainly believe so. Over the past two decades amazing advances have been made in studies on worms, flies and mice that have demonstrated that aging is not immutable. Nine mouse genes, for example, have been identified that extend maximal and mean longevity. If we could achieve comparable benefits in humans, then our “twilight years” would be filled with more health and vigour. David Sinclear, a longevity scientist at Harvard University, recently summarized the aspirations of longevity science this way: “The goal is to keep people out of nursing homes for as long as possible.” This year, Sinclear’s team will be testing the very first anti-aging molecule in humans in a clinical trial for diabetes. If successful, this kind of research could lead to a pill that retards aging and extends the number of healthy years humans can expect to live. Unfortunately, longevity science is grossly under-funded and receives little attention. Part of the reason for this neglect is that it is often tricky to distinguish between the real scientific work being done on longevity and the dubious, so-called “anti-aging” therapies currently being peddled to the public. And so there is a tendency to view all claims of “anti-aging” interventions with great suspicion. But there is now a credible scientific basis for believing that, in the foreseeable future, we may be able to safely and effectively retard human aging. The sooner we seriously invest in this science, the sooner we could enjoy the health and economic dividends longevity science may yield. The Boston Globe has an interesting piece on aging here. David Sinclair is an associate professor of pathology and director of the Sinclair Lab at Harvard Medical School. As I define it, disease is a process that prevents you from functioning in an optimal way. And that's what aging is. I think of aging as a collection of diseases. So we need to change our paradigm? Absolutely. The medical establishment regards aging as something we really can't do much about. The new science of aging says that's wrong and that we can intervene in the process. We'll probably find that one of the drugs we're working on to increase lifespan will also treat a specific disease - probably a disease of aging. The scenario I hope to see is that a doctor prescribes a medication for diabetes, and then says to the patient, "I have to tell you that as a side effect that you'll be protected against cancer, osteoporosis, and heart disease. Are you willing to live with that?" How do the new drugs work? They're targeting the body's natural pathways against aging. We've learned in the past 15 years that there are key genes that control the pace of aging; when one of them, SIRT1, is activated, in yeast or worms or flies or mice, it improves health. SIRT1-activating drugs are now in clinical trials for specific diseases. One of the nice side effects of these molecules is that they increase endurance. So these drugs might represent actual cures? The misconception is that because we study aging, the only drug we'd come up with is one that would prevent disease. But clinical trials have found that they can also treat disease. That's important because making drugs that prevent disease is extremely difficult and takes a long time to prove, but for something like diabetes, you can see results in three months. CNN has just posted the news that Randy Pausch has passed away. Paush was 47. A computer science professor at Carnegie Mellon University, Paush was diagnosed with pancreatic cancer in 2007. He gave a truly inspirational lecture here. If you have not watched Paush's famous "Last Lecture" it is a must see. The lecture is a story of human imagination, commitment, humour and love, and all in the face of insurmountable adversity. Randy Paush (1960-2008) is an inspiration to all of us. One of the great benefits of trying to engage with work in other disciplines is you sometimes have a EUREKA! moment when you come across the work of someone working on a related issue from a different perspective. And the light then clicks on and the things you were pondering for years now start to become clearer in your own mind. Well this week I had one of these experiences. I came across this excellent Ted's talk by Penn Psychology Professor Martin Seligman. It is a fascinating talk, so I recommend you listen to the whole presentation. Below I will briefly outline some of the details of what he calls "positive psychology". But let me briefly mention how this talk helped me piece together two distinct areas of my research. Two central interests of mine are the aspiration to retard human aging (see the previous 2 posts)and my perfectionist account of ethics (see here). The former topic is perceived by many as very contentious because it asks us to transcend the limits of the current approach to medical research. The current approach is to tackle each specific disease of aging (cancer, AD, diabetes, etc.). But we need to supplement this approach with one that also tackles aging itself, for doing that would make all our lives better in significant ways (i.e. more health, less disease and frailty, sounds good to me!). My interest in retarding aging relates to my account of ethics. Perfectionists care about human flourishing, and they celebrate excellence. And so I think my interest in these two issues are fuelled by each other. And listening to Seligman's presentation made me realise what a natural fit my two interests are. Seligman begins his talk by mentioning the benefits of the "disease model" in psychology. But then he highlights 3 major drawbacks. Firstly, psychologists became victimologists and pathologizers (they forgot people make choices, that they have responsibility). Secondly, they forgot about improving normal lives and high talent (the mission to make relatively untroubled people happier, more fulfilled, more productive). And thirdly, in their rush to repair damage, it never occurred to us to develop interventions to make people happier, positive interventions. The points raised by Seligman remind me of this previous post and the importance of fostering the "genetics of health" (rather than just study the genetics of disease). Seligman's insights are profound indeed, and they apply to *ALL* medicine, not just the treatment of mental illness. One reason why many recoil at the thought of cognitive enhancers, or slowing aging, is that they do not see the general goal of improving people's lives as something medicine should strive for. Medicine is limited to the goal of treating or preventing disease. But by limiting ourselves to this narrow understanding of medicine we threaten to forfeit great improvements to humanity. Why not strive for longer, healthier, happier lives? I'm amazed that so many people find it hard to be persuaded that such a goal is laudable, let alone something medicine should seek to promote. (3) we should be as concerned with making the lives of normal people fulfilling and with nurturing high talent as with health pathology. So how happy are you? Seligman has an interesting questionnaire online here. I just registered for the test myself this morning and took the "Authentic Happiness Inventory Score". The findings of positive psychology should be of great interest to moral philosophers. Rather than just invoking Aristotle's account of the good life, we can now invoke the empirical evidence that backs up what we thought all along- that Socrates was right, "The unexamined life is not worth living!". Following on from my previous entry, how does the aspiration to retard human aging figure in the "big picture" of the challenges facing humanity this century? Yes the diseases of aging ravage (and will continue to ravage) those living in the most affluent countries of the world, but what about the rest of the world? Is aging a problem for middle-income and low-income countries? Here I gather a few stats to help us get a handle on this issue. Let's start by considering how many humans die each year in the world. How many people do you think die in any given year? 20 million? 30 million? Higher? And what do you think kills most people? Is it war? Climate change? Starvation? The first question is easier to answer than the second. It is not always easy to determine the "cause of death" because it is often the case that many different things lead to a person's death. But if we venture over to this site at the World Health Organization, we see that in the year 2002 approximately 57 million people died. Furthermore, "cardiovascular diseases kill more people each year--in high, middle- and low-income countries alike--than any others. In 2002, 7.2 million people died of coronary heart disease, 5.5 million from stroke or another form of cerebrovascular disease". Ah, after digging around for a while I found something which indicated that WHO follows the categories used by the World Bank....so, heading over there, we see that middle-income countries account for almost half of the world's population. And you can see a map of these 86 countries here. Let's stop here for a moment and consider the case of the world's largest country- China. What are the 3 leading causes of death in a middle-income country like China, and how do they compare to a rich country like the U.S.? I suspect many people will think the 3 leading of causes of death are very different, but they are in fact *identical*. This study on deaths in China puts the 3 top causes of death as cancer, heart disease and cerebrovascular disease. And if you head over to this CDC site for the US you see the same top 3 causes of death. This is very telling. And it helps us see the role age-related diseases play in most of the world (rich and middle-income countries). In high-income countries more than two-thirds of all people live beyond the age of 70 and die of chronic diseases: cardiovascular disease, chronic obstructive lung disease, cancers, diabetes or dementia. Lung infection remains the only leading infectious cause of death. In middle-income countries, nearly half of all people live to the age of 70 and chronic diseases are the major killers, just as they are in high-income countries. Unlike in high-income countries, however, HIV/AIDS, complications of pregnancy and childbirth and road traffic accidents also are leading causes of death. In low-income countries less than a quarter of all people reach the age of 70, and nearly a third of all deaths are among children under 14. Although cardiovascular diseases together represent the leading cause of death in these countries, infectious diseases (above all HIV/AIDS, lung infections, tuberculosis, diarrhoeal diseases and malaria) together claim more lives. Complications of pregnancy and childbirth together continue to be a leading cause of death, claiming the lives of both infants and mothers. And so when tackling aging we need to think about the life prospects of the hundreds of millions of aged women that will be living in Asian and Africa this century. Retarding aging would help them enjoy greater health and vigour in later life. The goal of tackling aging would not simply benefit those in the richest countries. Everyone, rich and poor, would benefit. To see how countries that are less affluent still suffer from chronic diseases compare, for example, this chart with this one. The first chart examines the state of chronic illness in the rich countries. Death by chronic diseases are set to rise. Why? Because these populations are experiencing the cellular and molecular damage of senescence. Even lower middle-income countries are suffering this same fate, as deaths from diabetes are set to rise by 48%. Now of course aging is not the only factor at play here. So are changes in eating habits and lifestyle. But these drastic expected rises in the chronic diseases would be significantly lower if all the adults living in these countries were 20 years of age. ** As noted before, being 20 years of age is often a very effective shield (though not full-proof) against chronic diseases like cancer and heart disease. Aging dramatically increases our risk for these diseases, and all other age-related disadvantage. And so it is imperative not to lose sight of this fact. For if we do, we will take a much more limited view of the potential prescriptions for addressing these pressing problems. So what have we learned from this brief foray into the world's leading causes of death? The first thing to take away is that there are many, many problems to be addressed. These range from child mortality and HIV, to car accidents and suicide. But there is no denying the fact that aging will be implicated in the vast majority of deaths among the world's current 6.6 billion plus population. Of course causes of death are not the only thing that matters. And if senescence quietly and peacefully took the lives of still healthy and productive humans while they slept at night things might look different. But that is not how aging works (though it might if we retard aging, as that might also compress morbidity and mortality!). The diseases of aging are *chronic*. Aging makes us extremely vulnerable to many different horrible things, so that we spend many years frail and diseased. It also puts enormous strains on health care resources and age-entitlement programs like state pensions. Given all this, you would think there is a well-funded, global, rational plan for tackling the challenges of aging. Sadly there is not. And that makes the challenge of tackling aging even more of a challenge! *the chart above is from this WHO site. conditions, and nutritional deficiencies combined. And once we consider the age groups that die from chronic conditions, across the global, we see that over 75% (27 of the 35 million) of deaths from chronic disease occur among those aged 60 or over. 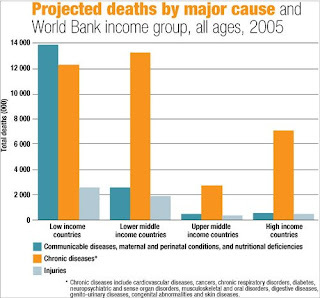 Death from chronic diseases account for 1.6 million deaths worldwide for people under the age of 30. And so these numbers help us get a sense of what the future holds for the world's aging population. Unless we tackle preventative measures for these chronic conditions, the world's aging populations will be ravaged by the diseases of aging. As I noted 2 weeks ago, my latest paper on tackling aging come out in the BMJ. And this was the first time I have been contacted by media to talk about something I have published. And so the past two weeks have been very interesting in terms of opening my eyes even further to the challenges longevity science faces. So I thought I would write down a couple of these thoughts and reflections here. Firstly, support for legitimate longevity science is hampered by the vast number of products currently being sold as "anti-aging" therapies without any science to substantiate their claims. See here, for example. And thus one has to be very careful when convincing people that (1) aging is something that ought to be retarded (as it increases our risks of morbidity and mortality); and yet at the same time convince them that (2) we might actually be able to slow human aging and yet (3) none of the current products being sold on the market have been demonstrated to do this (indeed, they might be harmful). The latter point is emphasized, for example, in this excellent piece in the Scientific American by Jay Olshansky, Leonard Hayflick and Bruce A. Carnes. Now if one is pressing (as indeed I am) (1) and (2), it is of course understandable that people will be want to do something about aging (and thus be tempted to violate (3)). But when asked "So what can I do to slow aging?" my response is "(a) support increasing the amount of public funding we invest in the biology of aging and (b) encourage linkages between different fields of research-- from genetics and evolutionary biology to engineering and statistics". Well, as you can imagine, many people will find that answer rather flat! They want the solution and they want it now (today)! The same is true about climate change. Few people have an interest in being told the best solution is investing in new R&D and might be long-term. Patience never was a human virtue. But Rome wasn't build in a day. Now with regards to retarding human aging (unlike climate change), the time-frame for success might actually be a decade or two. Recall my previous post here, that the first anti-aging molecule will be tested in humans this year. Things are moving fast. So while people need to be convinced of (1) and (2), we also need to caution them about trying to find solutions in the wrong places (turning to "alternative" medicine). Otherwise more and more money will be wasted on inefficacious products rather than on basic scientific research. And so reviving our optimism for scientific research is extremely important when it comes to longevity science. Another issue that arose from some interviews concerns healthy lifestyle. One interviewer asked me what I do to stay healthy. And I responded that "I exercise, watch what I eat, I don't smoke, and limit my consumption of alcohol". Of course this is then appears in print as things I do to "slow my own aging", and only until a longevity pill is created. Of course I did not say that. Healthy lifestyle does reduce the risk of disease but there is no basis for saying it actually modifies the processes of aging. Calorie restriction does, but I would not recommend any person pursue that severe lifestyle as a means of extending their health span. Healthy lifestyle is very important (as I have noted many times here, here and here), and it would not be replaced by the creation of a longevity pill. But the latter may also prove to be a very effective way of delaying and preventing the diseases of aging. And so, like exercise and diet, it should be part of the strategy of preventative medicine. "I don't understand the claim made that we cannot afford NOT to tackle ageing. The logical outcome of the 'advances' trumpeted by Colin Farrelly would surely be extension of active life and corresponding high consumption by wealthy populations with their high carbon footprint - at the expense of the poor - with a postponement of all the problems that beset old age at whatever time it occurs. There would be just the same burden of dementia, degenerative disease etc., just a few years later. What would be the net contribution of this change to overall welfare?" Thanks for your rapid response asking “Why slow aging?”. A few comments pertaining to your concerns about extending the healthy lives of, as you put it, “wealthy consumers”. (1) As you are a GP, I hope you do not see expanding the health prospects of your patients as something that comes “at the expense of the poor” and thus something contributing nothing to overall welfare. By this logic doctors in the developed world ought to deny *all* medical treatment to their patients so that their patients die as soon as possible, thus minimizing their carbon imprint! And I find it hard to think of a more perverse opinion for a GP to hold. 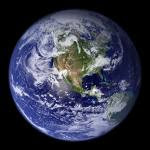 People in the developed world are human beings (not just “consumers”), and thus they do not deserve disease or death. (2) why assume slowing aging would only benefit those in the wealthiest countries? Many developing countries are aging the fastest. And the aged in poorer countries will be even more vulnerable to the disadvantages of senescence. And so slowing aging would also expand (not harm) the health opportunities for those in developing countries. (3) You claim that retarding aging would simply postpone “all the problems that beset old age”. There are two things to say about this. Secondly, even if slowing aging merely delayed the problems of old age, it would still be a significant and laudable accomplishment. This is so because it would increase the number of healthy years we can expect to live. All else being equal, it is better to suffer disease and death later in life than earlier. We wouldn’t abandon medical research for early onset diseases like CF just because, eventually, these patients would suffer age-related diseases like cancer or heart disease. No medical intervention can achieve more than a delay of death and disease. A cure for cancer would not stop the people who would have died of cancer from dying or suffering from heart disease, Alzheimer’s, diabetes, etc. And so the value of slowing aging should be measured by its likely impact on our health prospects. Contrary to respondent, I believe slowing aging has the potential to result in a significant improvement to overall welfare. A forlorn evolutionary biologist walks into a bar, and the bartender asks "why the long face?". "Because it helps alter my sensory interface with the physical world" replies the biologist. It has been proposed that facial expression production originates in sensory regulation. Here we demonstrate that facial expressions of fear are configured to enhance sensory acquisition. A statistical model of expression appearance revealed that fear and disgust expressions have opposite shape and surface reflectance features. We hypothesized that this reflects a fundamental antagonism serving to augment versus diminish sensory exposure. In keeping with this hypothesis, when subjects posed expressions of fear, they had a subjectively larger visual field, faster eye movements during target localization and an increase in nasal volume and air velocity during inspiration. The opposite pattern was found for disgust. Fear may therefore work to enhance perception, whereas disgust dampens it. These convergent results provide support for the Darwinian hypothesis that facial expressions are not arbitrary configurations for social communication, but rather, expressions may have originated in altering the sensory interface with the physical world. I have posted a couple of posts before on genetics and violence (see here and here), and this paper (by Guo, Cai and Roettger) in the latest issue of the American Sociological Review is an excellent example of how the genetic revolution will have a profound impact on our understanding of human behaviour. The UNC press release is here. Why do some individuals become serious and violent delinquents while others do not, despite growing up in similar social contexts and participating in similar social processes? We maintain that part of the answer lies in genetic propensities. Social conditions may be sufficient to produce delinquency in some individuals, whereas for others both social conditions and genetic propensities may be needed to make a difference. The relationship between social conditions and genetic propensities may be additive or interactive. To illustrate, suppose that family disruption and genetic propensities each increase the probability of a delinquent act by .1. If the two are additive, the total increase would be .2 when both are present. If the two are interactive, the total could be .4, significantly larger than .2. In such a scenario, genetic propensities could amplify the effect of family disruption or family disruption could amplify the effect of genetic propensities. ....The key innovation of this study is the incorporation of molecular genetic variants into a social-control life-course model of delinquency. We use three genetic polymorphisms in the DAT1, DRD2, and MAOA genes to measure genetic propensities for delinquency and criminality. All three genetic variants are significantly related to self-reported serious and violent delinquency in a model of social control—a social-control model that includes social-structural conditions and a number of indicators for family and school processes. ....Our findings confirm that genetic effects are not deterministic. The expression of the genes may depend heavily on environment. In both the MAOA and DRD2 models, the genotype effect changes dramatically when an interaction with environment is allowed. Conversely, the socialcontrol effect also changes radically once an interaction with a genetic variant is introduced. The latter point can be illustrated by the MAOA*2R grade retention interaction result for serious delinquency in Table 7. For those who do not have a 2R allele, repeating a grade raises serious delinquency by .451, but for those possessing a 2R allele, repeating a grade raises serious delinquency by a drastic 6.61. 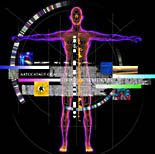 ....Emerging molecular genetic evidence suggests that individuals may differ in innate propensities for a wide variety of traits and behaviors. As genetic evidence increasingly points to intrinsic individual differences, the social sciences may need to incorporate this development. In studies investigating causes of delinquency, the incorporation of genetic evidence may help to estimate social-control effects (which may be correlated with genetic effects) more precisely, improve model prediction, and reveal interactions with social-control processes. The development of contemporary molecular genetics has created challenges and opportunities for the social sciences. Meeting the challenges and opportunities will advance our understanding of how individual traits and behaviors are affected by social processes. The BMJ has posted two Analysis articles on tackling aging here. The first is "New model of health promotion and disease prevention for the 21st century" by Robert N Butler et. al. One of the co-authors, Jay Olshansky, has a very informative interview on the paper here. Has the time come to get more serious about the effort to slow human ageing? The advocates of the longevity dividend believe it has. On 12 September 2006 the not-for-profit citizen advocacy organisation Alliance for Aging Research held a Capitol Hill symposium entitled “Going for the longevity dividend: scientific goals for the world’s aging populations.” This campaign calls on Congress to invest $3bn (€2bn; $1.5bn) annually into understanding the biology of ageing. That would amount to about 1% of the current Medicare budget. In an era where media headlines are dominated by the war on terror and global warming, and much of the world’s population live in conditions of poverty and disease, it might seem insensitive and unfair to suggest that we should divert more scarce public funding into tackling ageing. But such a knee jerk reaction can be overcome once you consider the science and ethics behind the proposal. ....The evolution of humans is an amazing story but one that may require (further) human intervention to help alleviate or postpone some of the intrinsic fallibilities we have inherited from our evolutionary legacies. ....Almost half (45.1%) of the current population over 75 years of age have their activity limited by chronic conditions. Older people are less resistant to injury, whether from physiological events (for example, surviving a heart attack) or environmental trauma (for example, bone fracture), and they are less resistant to infection. ....The ultimate goal of retarding ageing is the same goal that cancer therapies strive for—namely, to extend healthy living. This can be achieved by curing disease but it can also be achieved by increasing the duration of disease-free life. There is no reason why we cannot pursue both strategies—aggressively tackling individual diseases and ageing. Given the high stakes involved, policy makers must be both imaginative and ambitious. So given where the science actually is, the magnitude of the benefits of even modest success, and the certainty and severity of the costs of inaction, the longevity dividend campaign deserves a prominent place on the policy agenda. I have been following the fascinating developments of the anti-aging molecule resveratrol (see here and here). Resveratrol is a molecule found in red wine and very high concentrations of it (that is, the molecule not wine!) mimics some of the benefits of calorie restriction. A small molecule that safely mimics the ability of dietary restriction (DR) to delay age-related diseases in laboratory animals is greatly sought after. We and others have shown that resveratrol mimics effects of DR in lower organisms. In mice, we find that resveratrol induces gene expression patterns in multiple tissues that parallel those induced by DR and every-other-day feeding. Moreover, resveratrol- fed elderly mice show a marked reduction in signs of aging, including reduced albuminuria, decreased inflammation, and apoptosis in the vascular endothelium, increased aortic elasticity, greater motor coordination, reduced cataract formation, and preserved bone mineral density. However, mice fed a standard diet did not live longer when treated with resveratrol beginning at 12 months of age. Our findings indicate that resveratrol treatment has a range of beneficial effects in mice but does not increase the longevity of ad libitum-fed animals when started midlife. Things have been a bit slow here the last week or two as I had to pack up my office at UW and am in the process of relocating the family up to Kingston. But I expect to post a few thoughts on the various projects I am currently working on. These include a few new papers on the imperative to tackle aging, teasing out the social and political implications of my perfectionist ethics (see post #1 below) and a paper (that builds on this one) which examines how the "resource curse" impacts patriarchy (see here). So little time, so many interesting and important things to ponder! ...another disagreement now embroils researchers studying ageing: the debate about how they should frame the moral imperative to retard human ageing. Is ageing actually a disease? If so, should we invest more public money to find a cure for it, or are the medical interventions that could retard ageing best classified as 'enhancements' rather than therapies? Does this really matter and, in any case, do the answers to these questions have an impact on the prioritization of research into human ageing? This ethical and social debate is mostly confined to the field of biogerontology. Scientists who are working on applied research to find treatments for cancer or Alzheimer disease, for example, seldom find themselves pressed to offer a rationale for why they are doing so: it is apparently self-evident that a cure for cancer or Alzheimer disease is desirable and important. Yet, research into ageing pushes the medical orthodoxy in ways that research into treating a particular disease does not. This explains the interesting and spirited debates among biogerontologists about how to pitch the importance of their research to the general public and policy makers, and how to make a compelling case for diverting a greater share of public funding into ageing-related research. .... the aspiration to find a reasonable balance between tackling ageing itself and the diseases that are associated with ageing stands a chance of being proportionate only if all of the advocates of scientific research are playing by the same rules—in terms of the promises made and timescales estimated when appealing for public funding. This is where the second strategy appears to be too conservative and, hence, problematic. To achieve proportionality, policy-makers and the general public need a sense of the magnitude and likely timescales of the benefits that could be delivered by intervening with the biological processes of ageing versus those promised by the strategy of tackling one disease at a time. The greater the magnitude of these benefits—even if one abandons the 'ageing is a disease' premise—the greater the portion of public funds that should be invested in ageing-related research. ....asserting that the aspiration to retard human ageing is a moral emergency does not mean that the interests of those who are currently afflicted with the pathologies that accompany ageing have no moral weight. Yet, modern medicine is severely limited in terms of the substantive health benefits that it can confer on those who already suffer from these afflictions. Now that we have good scientific evidence for believing that we could alter this situation—so that future generations do not suffer the same fate—we have a moral obligation to humanity to respond in a fair and proportionate manner, and to mitigate the biological vulnerabilities that we have inherited from our evolutionary history.